Aras Eanna by Theresa Urbanska. THE ÁRUS Éanna Arts Centre in Inis Oírr will celebrate the 10th anniversary of its founding with an exhibition of painting and photography. The exhibition will be held in the Town Hall Theatre and be officially opened by Val Ballance, venues director of The Arts Council, and a former director of Áras Éanna, on Friday August 6 at 6pm. The exhibition will feature more than 30 artists and works will be for sale, with proceeds going towards the upkeep of the centre. Artists featured in the exhibition include Seán Ó Flaithearta from Inis Mór; former artists in residence Arno Kramer and Carel Lanters from Holland; Conamara based artist, musician, fisherman, and science journal editor, Brendan O' Súilleabháin; and a sea costume by Dublin artist Jeni Roddy will also be on display. 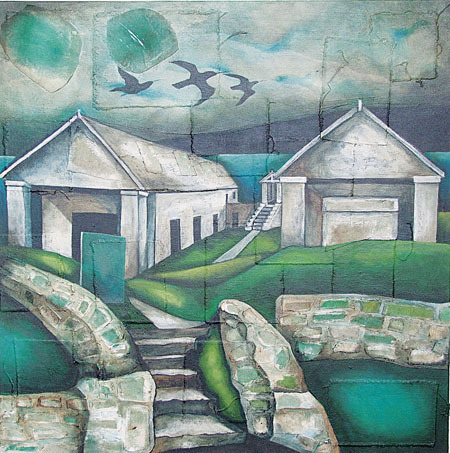 Longford born, Inis Oírr based, musician Pat Quinn will also exhibit one of his paintings at the show. At the opening he will join other musicians for a few songs. Since opening in 2000 the Áras Éanna Arts Centre on Inis Oírr has welcomed artists in residence as well as hosting concerts in its 70 seat theatre, which doubles as the island’s cinema. Originally built as a knitting factory the centre houses an exhibition gallery, café, and work space for crafts people including the island’s traditional basket makers, quilters, and weavers as well as the island’s pre-school and active age group. Cleas, a professional Gaelic/English language translation service is also based at the centre. Áras Éanna also features regular concerts. Damien Dempsey will play on Saturday September 25. The exhibition runs until September 5 and will afterwards transfer to the Ballinasloe Public Library.